The activities of the CNT in Spain have been a source of much discussion due to its size and influence. Being the only nation in Western Europe where anarchism remained the largest influence on the labour movement, both anarchists and non-anarchists have studied the organisation and discussed its successes and failures. Unfortunately, as part of this process those opposed to anarchism (particularly Marxists) have spread numerous myths regarding the movement and specific events (most obviously, the social revolution of 1936). So common-place are these myths in Marxist accounts of Spanish Anarchism, An Anarchist FAQ (AFAQ) has a dedicated appendix on the subject (part of a bigger appendix on replying to Marxist attacks on anarchism). Suffice to say, this account is extremely selective and, indeed, can be considered misleading in terms of what it omits. We shall explain why. Regardless of the activities and aims of the revolt, the question of the reaction (or non-reaction) of the Catalan CNT remains. Ealham claims that, despite recounting previous massive state repression by the rebels of October 1934, the actions of the Calatan libertarians “was narrow-sighted sectarianism” as they “remained aloof from the revolution that they had desired for so long.” The reality of the revolt is somewhat at odds with this summary. First, we have the strange paradox of how the CNT both “remained aloof” from the revolt and “issued a call to the Barcelona proletariat to return to work.” If the CNT workers were on strike, then how could the CNT be “aloof” of the revolt? “It is ironic,” notes Scottish anarchist Stuart Christie, “that the first shots to ring out in Barcelona were aimed against the CNT by those in revolt against the central government.” [We, the Anarchists!, p. 86] Hence the paradoxical situation in which the libertarians found themselves in during this time. As Abel Paz argued: “For the rank and file Catalan worker . . . the insurgents . . . were actually orienting their action in order to destroy the CNT. After that, how could they collaborate with the reactionary movement which was directing its blows against the working class? Here was the paradox of the Catalan uprising of October 6, 1934.” [Durruti: The People Armed, p. 158] Perhaps unsurprisingly many CNT members and activists were unhappy to be used as cannon-fodder to help produce another (left-wing) government that would attack the CNT. Suffice to say, why these actions of state repression by the October rebels against the CNT are not “narrow-sighted sectarianism” is not explained by Ealham – perhaps arresting people, censoring their press, shooting at them, closing their offices and trying to arrest their committees is not sectarian? Given all this, can the failure of the revolt be laid at the “narrow-sighted sectarianism” of the CNT? Is “sectarianism” the appropriate word to describe the actions of people who were being arrested, having their press censored, being stopped opening their union halls and being shot at when they tried to take part in a revolt by the very people organising the rebellion? Clearly, it strains credibility to suggest that the anarchists can be blamed for what happened during October 1934 in Catalonia. This is addressed more fully in the appendix on “Marxism and Spanish Anarchism.” The results of the October revolt and the unwillingness of the Marxist organisations to favour a “bottom-up” alliance would both have influenced the decisions made after the defeat of the fascist coup in July 1936. As is well known, on the 20th of July the CNT decided to collaborate with other anti-fascist organisations in the “Central Committee of Anti-Fascist Militias” (CCAFM). 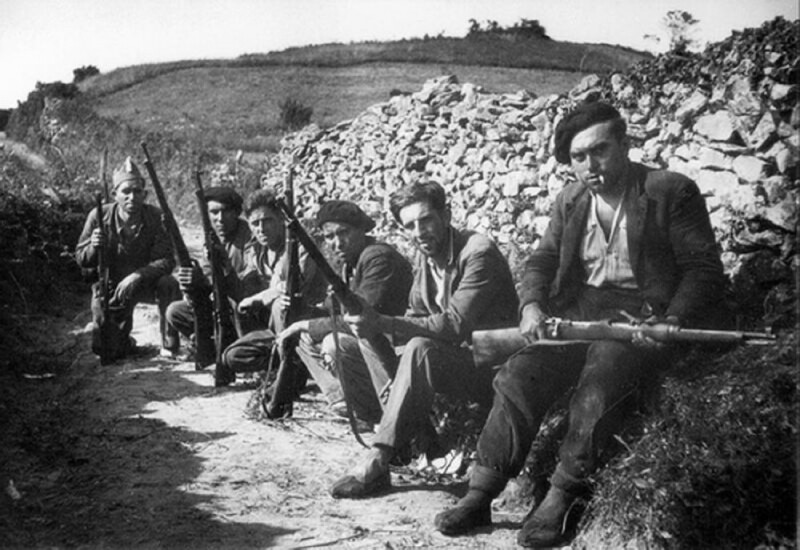 This was, obviously, an application of the Spanish Marxist’s preferred form of alliance – a top-down joining of upper committees rather than a genuine alliance from below – driven by the fear of a fascist victory which would have made the repression after the Asturias revolt seem mild in comparison. Subsequent attempts by the CNT to suggest non-”Popular Front” style structures (such as the “National Defense Council” of September 1936) were rejected by the Socialist Party. This process was started in 1936 but the CNT ignored the state and failed to smash it, in the name of unity against fascism. This meant that these embryonic organs of a free society could not develop fully and, once the state was strong enough, they were smashed. As such, the Catalan CNT ignored one of the key notions of anarchism (and its pre-war political programme) – the need to destroy the state and replace it with organs of popular self-management. Such a body was created by the CNT in Aragon, for example. This is means that the decision to participate in “Popular Front” style structures in Catalonia was not driven by “ideology” but rather by the circumstances the CNT found itself in (not least the ideology and attitude of the second largest union and the various Marxist political parties). This issue is discussed in more detail in AFAQ and so will not be done here beyond note the irony of the CNT being condemned in 1934 for not joining the Workers’ Alliance and for joining one in 1936. Needless to say, the attitude of Companys had not miraculously changed since October 1934 and explains the repression directed against the CNT which made it effectively impossible for that organisation to participate in that revolt even though it tried. In short, Ealham’s account omits too many relevant facts to present anything but a distorted account of how the Catalan CNT responded to the October events. It is little better than the standard (and utterly misleading) Trotskyite account by Felix Morrow – a damning judgement on any historian.